We are trying to come up with a numbering system for the asset system that we are creating, there has been a few heated discussions on this topic in the office so I decided to ask the experts of SO. Considering the database design below what would be the better option. Example 1: Using auto surrogate keys. Just a bit of background information, we will be using the Road Number and Segment Number in reports and other documents, so they have to be unique. I have always liked keeping things simple so I prefer example 1, but I have been reading that you should not expose your primary keys in reports/documents. So now I'm thinking more along the lines of example 3. I am also leaning towards example 3 because if we decide to change how our asset numbering is generated it won't have to do cascade updates on a primary key. EDIT: Thanks everyone for the great answers, has help me a lot. This is really a discussion about surrogate (also called technical or synthetic) vs natural primary keys, a subject that has been extensively covered. I covered this in Database Development Mistakes Made by AppDevelopers. What’s the best practice for Primary Keys in tables? Which format of primary key would you use in this situation. Should I have a dedicated primary key field? Auto number fields are the way to go. If your keys have meaning outside your database (like asset numbers) those will quite possibly change and changing keys is problematic. Just use indexes for those things into the relevant tables. I would personally say keep it simple and stay with an autoincremented primary key. If you need something more "Readable" in terms of display in the program, then possibly one of your other ideas, but I think that is just adding unneeded complexity to the primary key field. I'm also very strongly in the "don't use primary keys as meaningful data" camp. Every time I have contravened that policy it has ended in tears. Sooner or later the meaningful data needs to change and if that means you have to change a primary key it can get painful. The primary key will probably be used in foreign key constraints and you can spend ages trying to sort it all out just to make a simple data change. I always use GUIDs/UUIDs for my primary keys in every table I ever create but that's just personal preference serials or such are also good. used for a particular row. Go with option one and format the value in the app to look like option two or three when it is displayed. By definition, all Candidate Keys are created equal. They are each unique identifiers for the table in question. Your job then is to select the best candidate from the pool of Candidate Keys to serve as the Primary Key. The Primary Key will be used by other tables to establish the relational constraints, but you are free to continue using Candidate Keys to query the table. Once you've identified the Candidate Keys, the criteria above can be used to select the Primary Key. If there is not a "Natural" Candidate Key meets the criteria, then a Surrogate Key that does meet the criteria can be created and used as mentioned in other answers. Follow the Don't Use policy. You need to generate keys from more than one host. Someone will want to reserve contiguous numbers to use together. How meaningful will people want it to be? Wars are fought over this, and you're in the first skirmish of one already. "It's already meaningful, and if we just add two more digits we can ..." i.e. you're establishing a design style that will (should) be extensible. If you are concatenating the two, you're doing typecasts which can mess up your query Optimizer. You'll need to reclassify roads, and redefine their boundaries (i.e. move the roads), which implies changing the primary key and maybe losing links. There are workarounds for all this, but this is the kind of issue where workarounds proliferate and get out of control. And it doesn't take more than a couple to get beyond "Simple". As mentioned before, keep your internal primary keys as just keys, whatever the most optimal datatype is on your platform. However you do need to let the numbering system argument be fought out, as this is actually a business requirement, and perhaps let's call it an identification system for the asset. That way different people who need to access the asset can identify in their own way. For example the server team will identify a server differently from the network team and different again from project management, accounts, etc. Plus, you get to go to all the meetings where everyone argues with each other. Another thing to keep in mind is that if you're importing alot of data into this system, you may find out that things like Road_Number are not as unique as you thought, and there may be operational roadblocks to fixing the problem (repainting road signs, etc.) . While natural keys may have great meaning to the business users, if you do not have the agreement that those keys are sacred and should not be altered, you will more than likely be pulling your hair out while maintaining a database where the "product codes have to be changed to accommodate the new product line the company acquired." You need to protect the RI of your data, and integers as primary keys with auto-increment are the best way to go. Performance is also better when indexing and traversing integers than char columns. While not appropriate as primary keys, natural keys are very appropriate for user consumption and you can enforce uniques via an index. They bring a context to the data that will make it easier for all parties to understand. Also, in the advent that you need to reload data, the natural keys can help verify that your lookups are still valid. I would go with the surrogate key, but you may want to have a computed column that "formats" the surrogate key into a more "readable" value if that improves your reporting. The computed colum could produce example 2 from the surrogate key for instance for display purposes. I think the surrogate key route is the way to go and the only exceptions that I make for it are join tables, where the primary key could be composed of the foreign key references. Even in these cases I'm finding that having a surrogate primary key is more useful than not. I suspect that you really should use option #3, as many here have already said. Surrogate PKs (either Integers or GUIDs) are good practice, even if there are adequate business keys. Surrogates will reduce maintenance headaches (as you yourself have already noted). In other words, are the users concerned with maintaining active data or querying largely static data to find answers? If you are heavily focused on building an analysis and reporting DB (e.g. a data warehouse/mart) that is exposed to technical business users (e.g. report designers) who have a good grasp of the business vocabulary, then you might want to consider using natural keys based on meaningful business values. They help reduce query complexity by eliminating the need for complex joins and help the user focus on their task, not fighting the database structure. Otherwise you're probably focused on a full CRUD DB that has to cover all the bases to some degree - this is the vast majority of situations. In which case, go with your option #3. You can always optimize for queryability in the future but you'll be hard pressed to retrofit for maintainability. I hope you will agree with me that every design element should have single purpose. Question is what do you think is purpose of PK? If it is to identify unique record in a table, then surrogate keys wins without much trouble. This is simple and straight. As far as new columns in option 3 are concerned, you should check if these can be calculated (best would be to do calculation in model layer so that they can be changed easily than if calculation done in RDBMS) without too much of performance penalty from other elements. 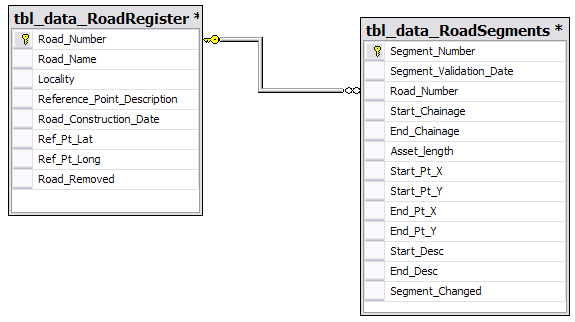 For example, you can store segment number and road number in corresponding tables and then use them to generate "00000001.1". This will allow to change asset numbering on-the-fly. First off, option 2 is the absolute worst option. As an Index, it's a string, and that makes it slow. And it's generated based on business rules - which can change and cause a rather large headache. Personally, I always use a separate primary key column; and I always use a GUID. Some developers prefer a simple INT over a GUID for reasons of hard-drive space. However, if the situation arises where you need to merge two databases, GUIDs will almost never collide (whereas INTs are guaranteed to collide). Primary Keys should NEVER be seen by the user. Making it readable to the user should not be a concern. Primary Keys SHOULD be used to link with Foreign Keys. This is their purpose. The value should be machine readable and, once created, never changed. Not the answer you're looking for? Browse other questions tagged database database-design primary-key or ask your own question. Use item specific prefixes and autonumber for primary keys? Which is the most common ID type in SQL Server databases, and which is better? Native primary key or auto generated one?